A card chosen by a spectator is turned face up on the back of deck and displayed towards the audience. 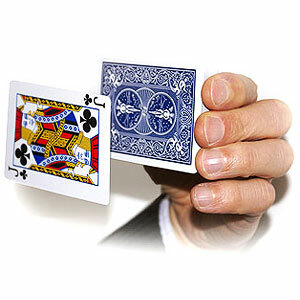 Suddenly, the card starts floating out towards the audience away from the deck, remaining suspended at about 2". It just looks like it is FLOATING IN THE AIR, IMPOSSIBLE! The card then slowly floats back onto the deck. Also available only provided with the gimmick.